Pakistani security forces have announced the arrest of Akhtar Zaman Mahsud, the alleged Amir of the Karachi branch of the Tehrik-i-Taliban (TTP) as part of a major sweep of terrorist suspects in the strategically important port city. 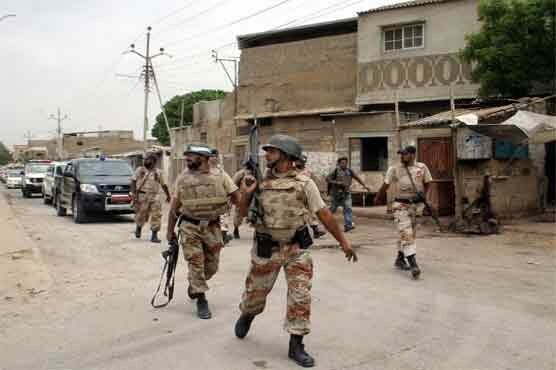 Security forces claimed Akhtar Zaman was arrested in Karachi’s eastern suburb of Sohrab Goth following an October 18 shootout with police. However, some police sources and members of the largely Pashtun Sohrab Goth community insisted Akhtar Zaman was actually arrested in a raid on a supermarket on September 14 (The News [Islamabad], October 21; PakTribune, October 20). The alleged TTP commander and three others arrested with him (including Samiullah, a.k.a. Shamim, Fazal Kareem and Munawar Khan) were charged with involvement in an unsuccessful attack on the Kemari Oil Terminal on the night of September 14. One Islamabad daily quoted an anonymous senior police source as saying, “If we produce an accused before the court after 24 hours of his arrest, it becomes a case of habeas corpus, so normally police show the arrests of accused a day prior to their production in the court” (The News, October 21). A police official said the suspects also wanted to plant explosives in police installations and other sensitive points in Karachi. According to police, the men were armed with 75kg of cyclotrimethylene-trinitramine (RDX) explosives, three Kalashnikov assault rifles and a TT-model pistol, commonly used as a police sidearm in Pakistan but also made by the gunsmiths of the Khyber region. The seizure followed a larger one last week, which netted two suicide jackets, four Kalashnikovs, 17 hand grenades, nine detonators and a variety of ammunition for mortars, RPGs and rifles. Police claim these weapons belonged to the same Karachi cell of the TTP (Daily Times, October 19). Further raids by the Crime Investigation Department (CID) of the Sindh police on October 21 resulted in the arrest of Muhammad Sahib Khan (a.k.a. Qasai) in Sohrab Goth, as well as two accomplices in other parts of the city. According to police, Muhammad Sahib Khan confessed to being tied to a Swat-based TTP commander named Farooq. He was found in possession of a suicide vest and was already wanted by police for involvement in murders, assassinations, kidnappings and attacks on security services. Police charged Muhammad Sahib Khan and his accomplices with “trying to establish a Taliban network in Karachi,” as well as “plotting terrorist activities, including suicide bombings.” They were also accused of destroying schools in the Swat valley (The News, October 21; Dawn [Karachi], October 21). According to Pakistan’s Daily Times, some 60 second-level Taliban leaders evaded the government’s offensive in Swat earlier this year by traveling by train in small groups to Karachi, where the Karachi TTP arranged for their transit by plane to various points in the Gulf states (Daily Times [Lahore], October 19). The transfer went unnoticed because many natives of Malakand work in these same Middle Eastern states. Mahsudi tribesmen who have fled the turmoil in their native South Waziristan for Karachi suburbs like Sohrab Goth report shakedowns by local police who threaten to arrest them as TTP members, as well as marginalization by government agencies on the basis of ethnicity, which local elders claim threatens to drive peaceful Mahsudis into the arms of the Taliban (The News, October 21). Army Chief of Staff Ashfaq Pervez Kayani took the unusual step of writing an open letter to the Mahsud tribe, assuring them that the current operations in South Waziristan were aimed only at terrorists rather than the tribe as a whole (The Hindu, October 19). Though it lies over 1,000 miles from the military operations in the tribal regions of northwestern Pakistan, the port of Karachi has become a target of Taliban and al-Qaeda associated militants since April, when members of the Lashkar-e-Jhangvi (LeJ) terrorist group were detained while planning attacks on local transportation firms responsible for shipping supplies destined for NATO forces in Afghanistan. A campaign of threats and bombings is intended to disrupt the NATO supply chain, which relies on Pakistani companies and drivers to transport supplies along the 1,200 mile route from Karachi to the Khyber Pass. Karachi, the starting point of the route, was once regarded as a safe port, but recently it has been subject to infiltration by Taliban and al-Qaeda sabotage units. 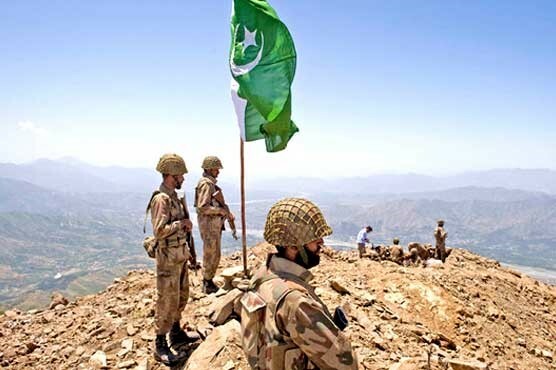 Earlier this month security forces arrested five members of the Lashkar-e-Jhangvi (LeJ) terrorist group who were planning attacks on transportation firms responsible for shipping NATO supplies to Peshawar. This followed a similar roundup of militants last January after they threatened transporters not to carry NATO supplies. The new Karachi Taliban leader, who gave an interview to the Daily Times on condition of anonymity, said the local TTP chapter was in accord with the ideology of TTP leader Hakimullah Mahsud but was not authorized to carry out operations (Daily Times, October 19). Establishing al-Qaeda’s battle is about establishing universal “servitude to God,” according to senior al-Qaeda commander Abu Yahya al-Libi who has expressed pride in the fact that his movement has no other agenda: “We are not a group that is concerned with finding economic solutions. We are not a group that is concerned with building skyscrapers. We are not a group that is concerned with finding solutions to social problems. All these problems were a result of people’s deviations, and occurred after the people agreed to become servants to other than God, the Great and Almighty.” The message was contained in a 45 minute video of al-Libi’s sermon on the occasion of Eid al-Fitr in September and posted to the web on October 27 (Al-Sahab Establishment for Media Production/Al-Fajr Media Center). Is Uganda’s Lord’s Resistance Army Operating in Darfur? Various reports are claiming that the guerrillas of Uganda’s Lord’s Resistance Army (LRA) have moved in bulk into South Darfur, where they will allegedly seek supplies and arms from the Sudanese government. The movement into Darfur was reported to have been compelled by helicopter attacks on the LRA by Ugandan Special Forces units operating out of Yambio, Sudan as part of a tripartite (DRC, Uganda, South Sudan) military offensive against the brutal fighters led by the notorious Joseph Kony. Most prominent of these was a front page cover story in Britain’s Independent daily asserting Kony and a significant part of his forces had crossed into southern Darfur (Independent, October 17). The main source in the story was a statement by Major-General Kuol Deim Kuol of the Sudan People’s Liberation Army (SPLA) of South Sudan that was carried in the Sudanese press two weeks earlier (Sudan Tribune, September 28). General Kuol claimed the bulk of the LRA forces had crossed from the Democratic Republic of the Congo (DRC) and the Central African Republic (CAR) into southern Darfur, where they had clashed with the local population. The General maintained SPLA reconnaissance groups had tracked the LRA across the border, where he suggested they would seek a safe base for their wives and families while seeking arms and ammunition from the Sudanese Armed Forces (SAF). However, the Independent reported Kuol saying hunters had encountered LRA fighters near the town of Tumbara. There is no such place in southern Darfur, though there is a Tambura in the southern part of Western Equatoria (South Sudan), close to the LRA’s operations in the CAR, but far from the border with southern Darfur. The Independent added that the LRA had moved into the “Raga district in southern Darfur.” Raga is in Western Bahr al-Ghazal, also part of South Sudan rather than Darfur. The director of communications from the United Nations/African Union Mission in Darfur (UNAMID) declared the mission had spent days going over reports of an LRA presence, but had failed to find any “hard evidence” to confirm them (Independent, October 17). The original Sudan Tribune story said that “Kuol suggested that Kony is seeking protection from the Sudanese army and may be used to fight the Darfur rebels” (September 28). Basing its report on the Sudan Tribune story, the Kampala Observer claimed several days later that Kuol had stated that the LRA were fighting as mercenaries alongside the Janjaweed militia in Darfur (October 4). Elsewhere, there were reports of LRA fighters killing two women in raids near Yambio in Western Equatoria at the same time the main group was reported to be crossing into Darfur (Sudan Tribune, October 16; New Vision [Kampala], October 16). 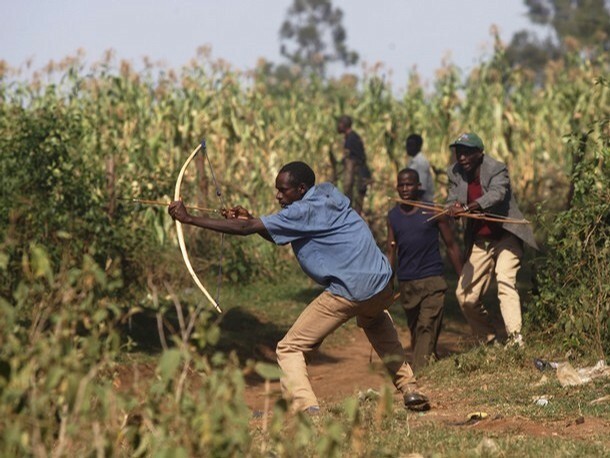 The fighters were driven off by members of the lightly armed Arrow Boys, a local self-defense group that combats LRA incursions with weapons such as spears and bows and arrows. Yambio is roughly 650 kilometers from the border with South Darfur as the crow flies – much farther in rough and road-less bush country. If these reports are correct, they would suggest either the main body of the LRA has abandoned elements of its forces in the move north, or is still operating in the area where the DRC, CAR and Sudan borders intersect. Other LRA units were simultaneously reported to be carrying out new attacks in the northern DRC (BBC, October 14). The presence in Darfur of the LRA, which is generally believed to have once been armed and funded by Khartoum in retaliation for Kampala’s support of the SPLA, would be a major embarrassment to President Omar al-Bashir, who is currently facing Darfur-related war crimes charges from the International Criminal Court (ICC). Salah Gosh, a senior presidential advisor who has been tied to war crimes in Darfur in his former capacity as director of Sudan’s National Security and Intelligence Services, accused the SPLA of issuing “fabrications,” adding, “The SPLA knows very well where Kony is” (Sudan Tribune, September 28). The reports of an LRA entry into Darfur came as Ugandan President Yoweri Museveni invited Sudanese president Omar al-Bashir to an AU summit on refugees held this week in Kampala (New Vision, October 14). Despite Uganda being a signatory to the ICC statute—and thus obligated to enforce the ICC warrant for al-Bashir’s arrest—Museveni said such an act would not be “according to the culture of the Great Lakes region in Africa… We do not believe in surprise attacks.” An ICC representative insisted Uganda had a responsibility to carry out the arrest (Daily Monitor, October 16). The issue was resolved when Sudan decided to send two junior ministers to the summit instead (New Vision, October 19). Sudan has also expressed its willingness to share its expertise in the oil sector with Uganda as the latter begins development of a one-billion barrel oil reserve discovered on the Albertine rift in Uganda (Dow Jones Newswire, October 1; Sudan Tribune, October 2). A commander of the Pakistan Taliban, Sahimullah Mahsud, recently provided a description of the measures taken by the Taliban forces and leadership to lower the impact of the American Unmanned Aerial Vehicle (UAV) missile attacks which have claimed the lives of scores of Taliban and al-Qaeda leaders in northwestern Pakistan, including the late leader of the Pakistani Taliban, Baitullah Mahsud. Based in South Waziristan, where he is a deputy to new Taliban leader Hakimullah Mahsud, Sahimullah provided the details in an interview with the Brussels-based Le Soir daily (October 12). 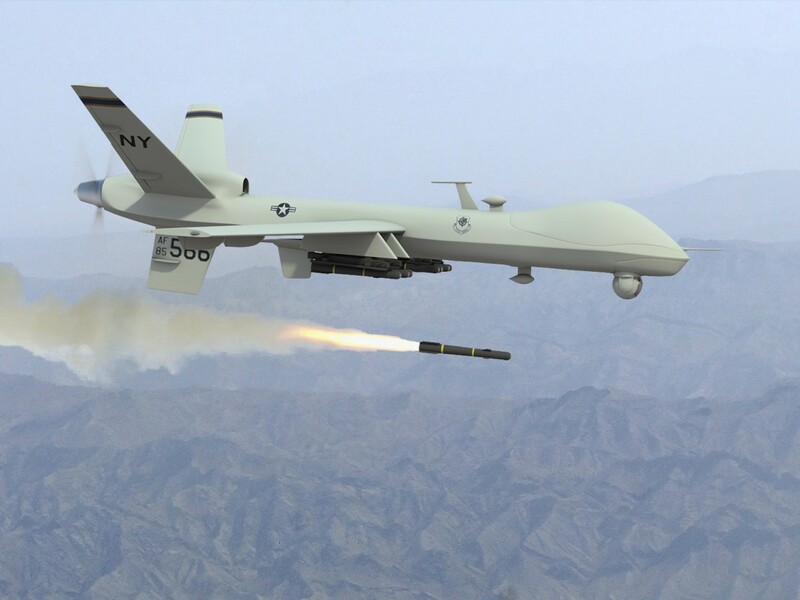 • If a drone is heard, fighters must disperse into small groups of no more than four people. The Taliban have weapons capable of shooting down the drones, but lack the technology to detect their approach. • Satellite or SMS [a form of text messaging on mobile phones] forms of communication are no longer used. All communications are done orally or by code. • Meetings are announced only at the last minute, with nothing planned in advance in order to avoid leaks. Even senior commanders do not know the precise location of regional commanders. • Taliban security agents are constantly checking the identity and credentials of those active within the movement. The Taliban commander added that the movement has many sympathizers within the Pakistan army and the security forces in Afghanistan who provide useful intelligence on infiltration efforts, the progress of NATO convoys and the timing and location of American or Pakistani military operations. American weapons are bought from the personnel of the Afghan National Army or seized in raids on NATO convoys.